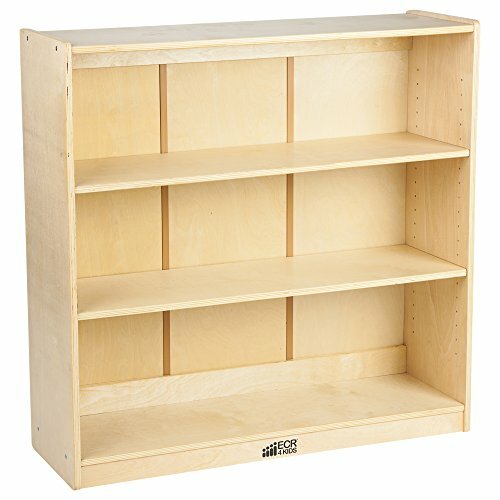 Organize children's favorite books and toys on each shelf at school, daycare or home on these sturdy birch bookcases by ECR4Kids. Available in three heights with adjustable shelves to accommodate keepsakes of all shapes and sizes. Each cabinet features an integrated anti-tipping wall mounting bracket, and pre-assembled reinforced base for extra durability and simpler assembly! Built with durable and strong birch and designed with rounded corners for added safety. Shelves adjust on a 1.25" spacing. All units are 36" W X 12" D with your choice of 36", 48", or 60" height. The base shelf measures 10.25" deep; all other shelves have a depth of 11". With a concentration on the Pre K-12 sector, ECR4Kids offers a wide range of products including classroom tables and chairs, preschool rest time solutions, hardwood storage cases, blocks and manipulative, mobile organizers and a variety of indoor and outdoor play structures.